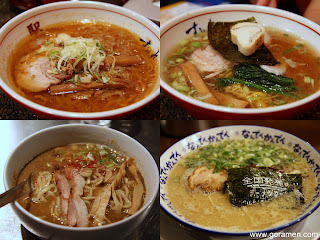 GO RAMEN!®: Day 26 - Ramen Round Table...in Japan! After spending way too much money on instant ramen at the Raumen Museum earlier in the day, it was time to meet up with two prominent Tokyo ramen bloggers for dinner: Nate from Waseda Ramen and Brian from Ramen Adventures. It was a good night of slurping ramen, having a few drinks, sharing our own ramen stories, and dancing like Kusanagi in the park. Wait, maybe I did that last part by myself...haha. It's probably a good thing that the 1000 yen all-you-can-drink Spanish wine was closed. I agree. Cuz then I may have danced like Kusanagi in the train. More Ramen goodness! :) This looks delicious. Bassa Nova especially.